JBL Control 26-DT Ceiling Speakers DJParts - All Variety of Parts that DJ Needs. Use instead of standard 8 inch driver. Fits standard backcans for 8 inch speakers. 60 Watt transformer for 70V or 100V distributed speaker lines. 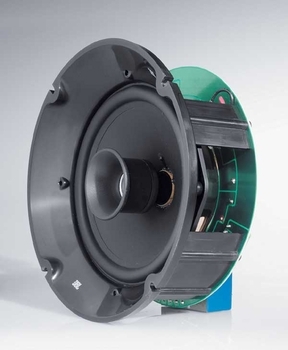 The Control 26-DT is a compact ceiling speaker assembly configured to install into standard ceiling backcans designed for 200 mm (8 in) drivers. High power handling, wide frequency response and low distortion make the Control 26-DT ideal for sound systems requiring a higher fidelity sound. The Control 26-DT includes a lowsaturations high fidelity, low insertionloss transformer for use with 70.7 V and 100 V distributed line systems. The transformer has a top tap rating of 60 W.
Low Frequency: 165 mm (6.5 in) polypropylene-coated, 1 in voice coil on aluminum former. Adapter flange to fit standard 8-inch mounting. Safety Agency Rating: In accordance with IEC60849 / EN60849. 4Calculated from sensitivity and power handling, exclusive of power compression.